Father’s Day – What to do? Get a Cookie Bouquet from Cookies by Design! Cookies by Design – a national franchise with 120 stores throughout the country – offers a full range of Father’s Day-themed cookie bouquets, sheet cookies, cookie cakes and gourmet cookie trays, ranging from $16 – $100+, including favorites such as the King of the Grill, Tee-Rific Dad and Dad Appreciation Highway cookie bouquets. 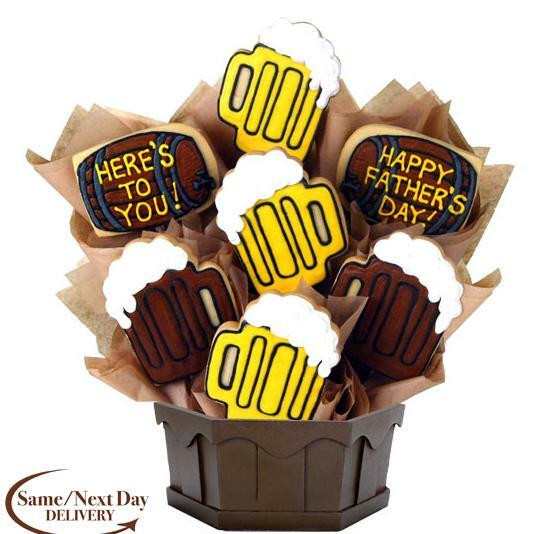 The complete line of Father’s Day cookie gifts can be viewed online at http://www.cookiesbydesign.com/fathers-day-gifts and can be customized by shape, color, photo and message to make it an especially thoughtful gift for dad! This year is my husband’s second Father’s Day! I have been struggling with what the twins should give him. What does he like? Typical guy stuff – sports, beer, tools… I didn’t want too get him a power drill, or a 6 pack.. I know my husband will LOVE it! It’s a huge bouquet and he (and I…. and the twins!) will just love it! It’s not the usual tie or money clip. Plus it can be delivered to his office 🙂 Surprise!! Cookies by Design is having an awesome Facebook Giveaway! To enter the drawing, simply “Like” Cookies by Design’s Facebook Page now through June 19. One winner will receive two tickets to an NFL, MLB or PGA event of his/her selection (regular season only; airfare/lodging not included). Three winners will each receive 12 cookie bouquets. All winners will be randomly chosen and posted on Cookies by Design’s website by June 24. Full giveaway rules are available on Cookies by Design’s Facebook page. To place an order, visit your local Cookies by Design store or contact a cookie consultant at 888-882-6654. While I was supplied with item(s) reviewed, I was not compensated for this post. All opinions and views expressed are my own.